In alphabetical order, here are our featured instructors for September. In a previous life Jen Carlton Bailly probably sold you a pair of jeans or khakis at The Gap. Today you’ll find her covered in thread and searching down the latest inspiration for a quilt. A self proclaimed master at curves, she finds pleasure in creating quilts with secondary patterns that make you stop and wonder. Originally from Utah, Jen found her way to Portland, Oregon via Colorado, New Mexico, and Seattle. While Portland is amazing, she misses the dry desert and the Rocky Mountains. Jenn is teaching three classes for us: One Curve, Five Blocks, 100s of Ideas, Secondary Designs and Beyond, and Scandinavian Flower Garden. Mathew Boudreaux (AKA Mister Domestic), resides in the Pacific Northwest with his husband, their young daughter Helena, and two cats. He is originally from Houston, TX and has managed to live all over the country during his adult life, but finally settled down and calls Camas, Washington home. During the day, Mathew works in the pharmaceutical industry specializing in oncology, but he is an artist at heart and has jokingly referred to himself as an artistic gypsy flowing from theater to modeling to photography to sewing. Mathew learned to sew as a kid, but never really got into it until he and his husband had their daughter. He thought it would be a great way to connect with her if he could make her cool clothes. Almost 40, he felt that his taste-level had arrived and that he could make some pretty neat-o digs, if only he could figure out how to do it. Before Helena could even crawl, his husband bought him a few sewing classes at Modern Domestic in Portland, which was the perfect jumpstart he needed because he hasn't stopped since. 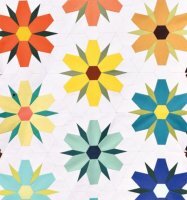 Mathew is teaching two classes for us: Flower Mania English Paper Piecing and Improv Flower. One of the things about quilting that has always intrigued Rosemary is the use of color in communicating shape, design and purpose. 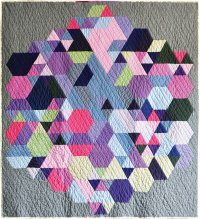 So, when she began creating quilt collages using hundreds of different pieces of fabric, the ability to create shape and dictate focus using hues, values and patterns took her work in a totally different direction than traditional quilting. Rosemary is drawn to fabrics that create the illusions of texture, movement, relief, and contours with lines, dots and shine. She takes in elements of the fabric while looking at the whole design. 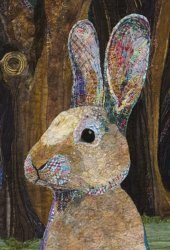 She quilts the finished mosaic with fine silk thread. Most of Rosemary's work revolves around animals, particularly dogs. She wants to capture each animal's expressions in her work so she always begins with the eyes. The face and body evolve intuitively by careful blending of color and pattern. Each fabric piece adds a level of depth, much the way a painting comes to life through shape, shading and color. Rosemary is teaching two classes for us: Bernice the Cat and Enchanted Rabbit. Christina is a quilter who loves spreading excitement and confidence to other quilters! She free-motion quilts on her home machine. She loves teaching free-motion quilting so much that she wrote some books about it! Then she started playing with wedge quilts, so she wrote about that too! Christina is happiest working without patterns, using up scraps and not taking things too seriously. She's a single mom and quilting is a part-time thing for her; in the "real" world she's a nurse-midwife and loves her job. 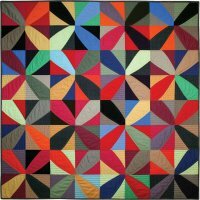 Christina is teaching four classes for us: Wedge Quilt, Magic Triangle, Jump into Free-Motion Quilting, and Wild Quilting. Elizabeth (Libs) Elliott is a textile artist and designer exploring the intersection of technology and traditional craft by using generative design to build handmade quilts. Libs studied Material Art & Design at OCAD University and received a B.A. in Cultural Studies at Trent University. Her commissions include work for individuals and corporate clients such as Absolut Vodka. She has exhibited her work and done speaking engagements internationally. She designs fabric collections for Andover Fabrics, Inc. Her work has been covered by press such as Gizmodo.com, Design Milk and Casa Vogue Brazil. Libs lives and works in Toronto, Canada. She loves travelling, exhibiting her work and speaking about what she does. Libs' quilts are randomly designed using a programming language called Processing. The project began in 2012 as a collaboration with artist and technologist, Joshua Davis, who provided the original code framework. Using Processing allows Libs to quickly edit the code and generate random compositions from simple geometric and traditional quilt block shapes. This ongoing project is an exploration in how modern technology can transform a traditional and tactile craft into modern functional art without abandoning the inherent pleasures of handcrafted products. Libs' goal is to underline the importance of craft as art in our contemporary age by producing bespoke modern heirlooms – just like quilts from a century ago, these are pieces that can be passed down through generations. Libs is teaching two classes for us: Weight of Love and Embrace the Chaos. Ellie Lum is an accomplished creative entrepreneur, artist, and skill-building educator based in Portland, OR. Ellie’s passion lies at the intersection of education, art, creative business, and environmental justice. Along with her passion for creating, she is deeply committed to sharing her skills with those who want to learn. As a business owner of 20 years in a craftsman-based business, R.E. 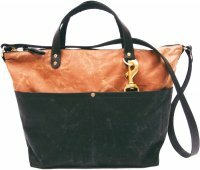 Load Bags, she has honed her skills as a leader and teacher instructing those who worked with her how to master the craft of industrial sewing as well as small business management. Ellie graduated from UC Berkeley with a B.S. in Ecoliteracy, where she studied adult hands-on learning theory in garden education. For the past few years she’s been teaching sewing and mentoring folks on their creative business ventures through her DIY Workshop and handmade goods brand, Klum House. Ellie is teaching her Fremont Tote class at Expo. When Pam opted for a severance package from a 30-year career in the high tech industry, she had no idea her admittedly obsessive hobby would develop into teaching and designing. As a passionate and popular teacher, nothing is more fulfilling for Pam than "aha" moments when a student discovers that creative voice, stretches their wings and conquers new ground. Pam is teaching two classes for us: Crosscut Blues and Loved to Pieces. Sujata Shah, a graphic designer and textile artist, is originally from Mumbai, India. This mother of three lives with her husband in Chester Springs, Pennsylvania. Sujata has won awards for her quilts in local and national quilt shows and designed quilt patterns under the name of Rangoli Designs. Her teaching experiences include workshops inspired by the quilts of Gee's Bend, needle-turn applique based on her original designs, and color and design workshops. Her quilts have been shown at AQS in Lancaster and Padukah and the Pacific Northwest Quilt-Fest. Her instinctive ability to work with colors and textures, combined with education in graphic design, has helped Sujata develop a unique style as a designer. Sujata draws her inspirations from imperfections and irregularities of free-spirited folk art and crafts from around the world. She believes that each handmade craft has a stamp of the maker. 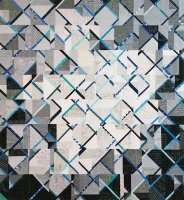 In 2014 she wrote the book, Cultural Fusion Quilts - A Melting Pot of Piecing Traditions where she introduced free-form blocks, an abstract interpretations of traditional quilt blocks to reflect her theory. Sujata will teach two fun classes for us: Peppermint Pinwheels and Windmills. Sheila grew up on the Minnesota prairie seeing long, unobstructed horizons and beautifully colored sunsets. The northern lights were a marvel in the fall. She was instilled with a sense of unlimited possibilities, a love of beauty, and a sense of wonder for color and how colors work together. In Sheila's family, they valued doing things with their own two hands as well as figuring things out one step at a time. Everything they did--whether gardening, farming, raising animals, building fences, fixing equipment, woodworking, sewing, cooking, or simply playing together--was done with creativity and pride. Sheila has been happy to produce some award-winning quilts. Traveling to give lectures, teach workshops and teach longarm quilting keeps her calendar full and interesting. 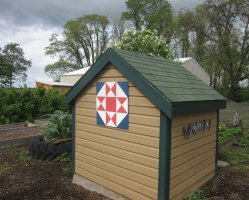 Sheila will be teaching two sessions of Painting Barn Quilts for us.